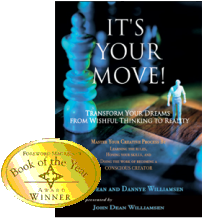 In 2001, we coined the term MindSlap!™ to create a visual for a life-changing discipline called conscious shock.Since then Williamsen Publications has been offering ”2x4 therapy for the 21st century” with books and CDs to motivate you to move your life — your inner life, your business, and your relationships— to the next level. Finding LIFE SOLUTIONS is the focus of our work at Williamsen Publications. Have you set up web sites, ezines, blogs, or sent out resumes and still haven’t succeeded in your business? Are you unable to determine the direction you want your life to go? Do you feel that this has more to do with your mindset than with what you've been doing? You’re not alone! The biggest challenge for anyone is creating clarity in their lives. It takes a willingness to observe yourself objectively and to engage in new ways of approaching your life. MindSlap! (or conscious shock) refers to the spiritual discipline of deliberately shifting from a conditioned reaction to a conscious choice. This shift in attention gives you the time you need to make a choice whether to respond as a thinking, creative being or to react like a mindless machine. If your choice is to not be a machine, you need to know about conscious shock. Although conscious shock is a valid tool in any endeavor, it is most effective when you use it in your personal psychology because your personal psychology drives your level of being, and your level of being determines your outer experiences. Without the application of conscious shock, your psycho-logical life suffers nearly the same debilitating effect as your physical body would have suffered without that first life-giving breath when you were born. It doesn’t exactly die, but it does stagnate. In terms of personal growth, stagnation is the same as death. Conversely, being dead psychologically means that the underlying ideas that motivate a person to react the way he does are never a consideration. The psychologically dead never connect the inner world of their thought to their outer world of experience. Life lives them; they do not live life. If your conditioned mind dominates you, even the knowledge you glean from spiritual philosophy falls on deaf ears. This is why years of study mean nothing if you haven’t applied the knowledge to yourself. But, even when you are applying your knowledge to your life, eventually you will find yourself in a place where you realize that you are starting to stagnate. You are definitely not the same person you were a few years ago, but you instinctively know that you have become comfortable with your current level of working on yourself - just like McDonald’s was comfortable with just being a successful hamburger joint. This is the moment when conscious shock can make the difference in whether you grow or stagnate. Remember that conscious shock is defined as the spiritual discipline of deliberately shifting from a conditioned reaction to a conscious choice. Even if you are working on your psychology, when you get used to a certain level of being, you develop conditioned reactions to it as well. To avoid stagnation and move on from that level of being demands conscious shock. You have to step outside your comfort zone. You have to stretch yourself. Challenge yourself! The status quo is an anathema to a person who wants to be a conscious creator of his or her life! So, how do you apply conscious shock? You start by mentally separating yourself into the observed and that which is observing. This separation gives you the space you need to objectively examine the impression being offered, your usual way of viewing things, and to decide how you want to embrace it. Anytime you choose a response that is contrary to your conditioned reaction, you are applying conscious shock. You are consciously choosing what you are willing to accept from life. What better way to upset the apple cart of the status quo? Mentally separating yourself from an outer action is the same way that psychologists teach people to break habits, such as smoking and nervous eating. Once you consciously recognize what is happening through observing yourself at every juncture, you literally change the neuronal pathways in your brain. Habits and conditioned responses take shortcuts. They bypass the frontal lobe, the seat of higher cognitive processes. Your conscious attention will serve to reroute the pathway so that the same impression travels instead through the frontal lobe where you can change your way of thinking about it. This deliberate effort, which is conscious shock, is like slapping yourself in the head with a two-by-four. It is literally a MINDSLAP! The reverberations from the impact of this action will positively change your life!